I saw the title and was immediately… scared to view the movie. 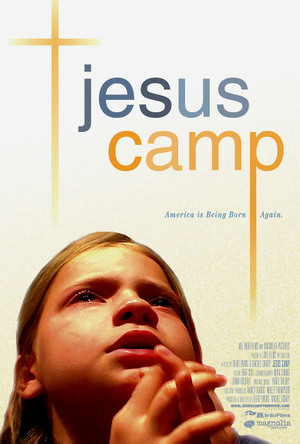 “Jesus Camp,” it’s called, and I’m sure many of you know all about it. I had heard of this film about an evangelical body of children who are being “taught” to be warriors for Jesus, but I hadn’t gotten around to seeing it yet. I saw it tonight through tear-filled eyes and worry-torn face. I am immediately on the defensive when evangelical Christians push the home-schooling cause in my face, but I have to remember: Jesus was not a separatist. He and his followers went out into the world and shared the Good News with all people. The disciples didn’t insulate themselves from the rest of the world. Doing so would not have furthered their cause. But besides this, what about the obvious answer to this question: I send my child to public school so that I can work and live my life too and so I can teach my daughter how to live a full and meaningful life. There are times when I wish I could home school my daughter in order to give her an individualized education, but I wouldn’t want her to miss out on knowing all kinds of people and on learning to choose her friends and activities wisely. 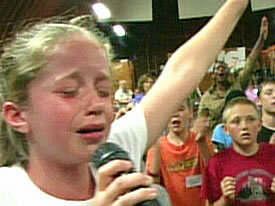 In another scene of “Jesus Camp,” a little girl of about 10 years speaks to the camera about “dead churches,” in which people sit quietly singing their hymns, when what God really wants is for us to SHOUT OUR PRAISES AND WORSHIP GOD OUT LOUD!!! I love the praise and worship time at my evangelical mega-church, but I have a hard time believing God wouldn’t be just as happy with quiet meditation as he may be with great jubilation. I think God is just content when we each worship Him in the way that means the most to us. “Cool” to possibly face death because of your faith? I think not. “Horrifying” is more along my line of thinking. Towards the end of the movie, a radio personality interviews Becky, the children’s minister who indoctrinates these children. He tells her that God has a place for people who do things to children, and it ain’t pretty. Amen to that! This movie troubles me for a number of reasons. One, I have a sister who’s evangelical, and I feel torn between wanting to support her as she home schools her four children to keep them safe from the world, and wanting to grab her and tell her she must let her children see the big world and learn to make it in the midst of all the chaos. Two, I go to an evangelical church that I love. The music is moving and mostly uplifting and energetic, and I feel a real connection to God when I worship in that way. Also, I find the sermons down to earth and easy to understand and apply to my life. On the other hand, I feel frustrated when the lyrics feel contrived and manipulative and when my minister tells me what God thinks. Third, I am in the beginning phases of planning a mission trip, but I don’t want to shove my theology down anyone’s throat. I don’t see it as my place to do that. So there’s a part of me that feels–like the children in the movie were made to feel–guilty that I’m being a hypocrite: claiming to be a Christian, but not wanting to tell others they must believe this or that or they’re going to hell. Finally, I am a mother and, of course, I adore my daughter. I want the best for her in terms of education, friends, faith, etc. I like my church and she does too. I want her to remain Christian throughout her life. But I want her to be able to interact with other people who don’t necessarily agree with her–kind of like we do in the blogosphere. I want her to be just as comfortable interacting with other Christians as she is with her Muslim or atheist brothers and sisters. I want her to be able to work alongside them to make the world a better place for all of us. I don’t want to be a warrior for Christ. I want to be His peacemaker in this world. Could it be that these kids have really experienced a relationship with a living God and have been given the wisdom and understanding that without Jesus, there is no life? The apostles in the first century knew this and couldn’t be quiet about it. Maybe the cry of these young hearts is an active movement of the Holy Spirit not just an indoctrination of some religion. I know it can be hard to tell the difference these days . . .